Zipper falling down? Waist too tight? But you love those pants and can’t bear to give up on them…We’ve all been there. 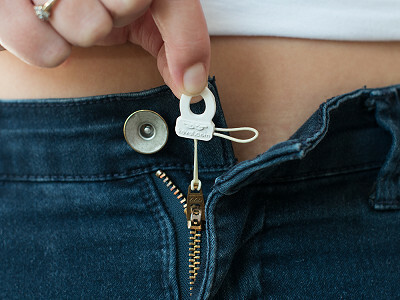 That’s why Rachel Kearl invented Kevel, a trio of problem solvers to keep pesky zippers securely in place and expand your pants to accommodate everything from bloating and weight fluctuations to pregnancy. With Kevel Fly Ties, you’ll never have to blush with embarrassment as a kind friend (or gasp! acquaintance) whispers those four dreaded words “your fly is down." Kevel Perfect Fit provides that extra bit of give your waistline needs when you’ve put on a few pounds or after a particularly indulgent meal. And then there’s the Kevel Mommy—a variation of the Perfect Fit that expands up to 3 sizes for early pregnancy and just after the baby is born. 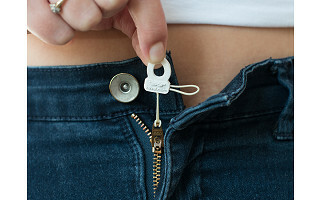 The next time the zipper on your favorite pair of jeans starts to fail or you put on a few pounds, there’s no need to go shopping. Kevel is an easy, affordable way to extend the life of your pants and avoid wardrobe malfunctions. Hi, this is Jill, the Director of Operations and I am here to answer any of your questions today. The Kevel Family offers clever clothing solutions. It adds value to your every day life. With Kevel, expand snug waistbands, banish sliding zippers and keep those favorite jeans, pants and shorts fitting comfortably. Please feel free to ask any questions you can think of; it's a pleasure to share this with all of you in The Grommet community! Hi Jill. Other than the number of units per package, I can't see a discernable difference between the Perfect Fit and the Mommy. Can you tell me the difference? Thanks. The Kevel Mommy is indeed the same great design as the Kevel Perfect Fit but includes a small, medium and large so the real mommy can grow bigger and bigger without worrying about it keeping up. Hi this is Jill Here! Thank you Philip for you question. Amy is correct. The Perfect Fit has two sizes and the Mommy has three sizes to grow with you and back post baby. @Jill Thank you Jill and Amy. Good idea, but too expensive for little pieces of plastic. Today's Grommet is a unique, new-to-market product and a sleek design solution to an everyday problem. It's also meant to last and can be put through the laundry. For a person who recognizes this problem or wants to save a favorite pair of pants, it could be a savior. @Amy @joan I would like to add that Kevel saves you money and time so you dont need give up those fav pair pants and shop for new ones! Hallelujah! I just realized that my favorite jeans (four pair) are too tight at the waist. Now I can still wear them. So glad I saw this before I started the laborious process of jean shopping. (As bad as swimsuits!) I think the price is right for four Kevels. Could you tell me the difference between the Fly Ties and the Perfect Fit? Yay! Glad you found Kevel! The Fly Tie is the solution for keeping your zipper up on your favorite pants. The Perfect Fit is what you are looking for to expand the waistband in your pants! @Jill Thank you for the info, Jill. Much appreciated! And thank you for your wonderful idea! Hi everyone! Kevel is very excited to be part of the Grommet Community! I will be here to answer all you questions! I'm thinking of buying a Fly Tie and a Perfect Fit. Since they're from the same company, do I really have to buy 2 of each in order to get free shipping, or will one of each be enough? You shipping estimate for one of each ($25) is as much as the items themselves! That's just too high, especially for such tiny items. I will ask the Grommet team your question and revert back. @Jill Got my answer when I ordered. Two in all of any of the three items is enough for free shipping! Since I already have two pairs of cords that fit great but sorely need fly ties, I'm really looking forward to getting them. Also, I miscalculated shipping costs any way. They would have been much lower even if I had to pay them. Sorry for bothering you, and thanks to Grommet for finding these problem-solving products. Yay!! You will LOVE your fly ties! Enjoy and thank you for shopping on the Grommet and buying Kevel! Can the Perfect Fit be made to work with pants that have a hook and eye closure instead of a button? The Perfect Fit only works with button. What if I only want one color, or one size? Do I have to buy four in order to get the one I want? The perfect fit and fly tie both come with 4 pieces each two black two white in the packet. The video shows an example of someone putting the kevel fly tie on, but not how it works in reverse. If you need to unzip your pants to go to the restroom, do you have to take the rubber piece off the button? Or is it stretchy enough to unzip when you need to? It's a cool invention, I would just be worried I wouldn't be able to get it undone quickly if I really had to "go right now". :) Thanks. You do need to take off the rubber piece off the button. It is really simple to do. We have not had any complaints to date. The best part you put it on and you leave it on. It can be washed and dried. You fav pair of pants that lost the zipper staying up power is back as a mainstay in your closet! I apologize, I answered you question incorrectly. The fly tie rubber piece stays on on the button and do not have take off. Sorry about that I confused it with the other products. @Jill I agree the shipping on most items will fit in an envelope! Well I Used to wear 32" waist jeans, Now oops, I'm a 34". Will these Kevel systems allow me to make up those 2"? @Roy It happens to the best of us! I suggest you buy the mommy which has a larger size. It is the same as the Perfect fit. This will give you more options. Jill, I was attempting to place an order for 2 of the Mommy but when I got to the shipping information it says that you do not ship to British Columbia, Canada. Would you please confirm that this is correct. Perfect timing! I am a 58 yr old private mechanic and I have a pair of expensive 'wicking' UnderArmor pants that I wear during the summer months to stay cool. They are about 3 yrs old but for the past month or so the fly won't stay up. I have been trying to come up with a devise to keep them up and then today I get a Grommet email that said "Zipper falling down?" I laughed and said out loud, "Yes... how did you know?" Great product idea, can't wait to get them. @Jill I'm still a bit confused about lowering the zipper, especially in a hurry, with the Fly-tie in use since the lower band isn't elastic. If that doesn't stretch, them it seems that the rubber ring would have to be disconnected from the button to lower the zipper. Good question. Yes, for the fly tie you would need to disconnect the round rubber piece from the button in order to lower the zipper. For the perfect fit and mommy versions, you'd need to first remove the extra band and then the rubber ring around the pants button. It doesn't take very much time at all however, especially if you are used to wearing them. Zipper falling down? Waist too tight? But you love those pants and can’t bear to give up on them…We’ve all been there. That’s why Rachel Kearl invented Kevel, a trio of problem solvers to keep pesky zippers securely in place and expand your pants to accommodate everything from bloating and weight fluctuations to pregnancy. With Kevel Fly Ties, you’ll never have to blush with embarrassment as a kind friend (or gasp! acquaintance) whispers those four dreaded words “your fly is down." Kevel Perfect Fit provides that extra bit of give your waistline needs when you’ve put on a few pounds or after a particularly indulgent meal. And then there’s the Kevel Mommy—a variation of the Perfect Fit that expands up to 3 sizes for early pregnancy and just after the baby is born.